In the United States, credit cards are everywhere. According to the American Banking Association, there are over 364 million accounts, which averages out to far more than one per adult. In fact, 75% of all American adults have at least one card, according to the Federal Reserve Bank. Americans use their credit cards as a secure and convenient method of payment, but they also enjoy their card’s benefits and rewards. While the stats tell the story of widespread usage, how do you gain access to a credit card if you’ve never opened one before? Here’s what you need to know before applying for a credit card for the first time. As popular as credit cards are, you still need to meet some minimum qualifications in order to be approved. First, you need to be 18 years of age to open a credit card account as a primary cardholder. Being a primary cardholder means that you are solely responsible for repayment of all charges. Alternatively, you can be an authorized user under someone else’s account. Authorized cardholders can make purchases, but aren’t responsible for payments. Authorized cardholders are also restricted from redeeming rewards or making changes to the account. Some credit card issuers will allow authorized users of any age, while others have minimum ages of 15 or 16. One of the benefits of being an authorized user on someone else’s credit card is that your credit score can benefit from the good credit of the primary account holder. This effect is sometimes called piggybacking. Another important consideration is having the credit necessary to qualify for a credit card. In fact, many young adults are reluctant to apply for a credit card because they assume that they have to have a credit history first, but that’s not always the case. The truth is that most credit card issuers will require some credit history. Unless you’ve been piggybacking as an authorized cardholder or used a credit builder loan, you probably won’t have much of a credit history or credit report when you turn 18. Starter cards are designed for people with limited or no credit history and usually come with a modest line of credit, which could be as little as $100 or less. For example, many people’s first credit card is a store charge card that can only be used for in-store purchases. While you might only receive a very small line of credit, it’s enough to start building credit immediately. Some banks also offer cards for first time applicants, and there are several student credit cards that are designed for full-time college students with little or no credit history. The second type of credit card are secured cards, which are available to applicants with no credit history and even those with bad credit. Secured cards are different than your typical unsecured credit cards, which is what most people think of when they think credit card. These cards usually require a minimum refundable security deposit of at least $200, and the size of your deposit becomes your credit limit. If you’d rather not have to submit a deposit, a starter card might be your best option. Once your account is opened, a secured card works just like any other credit card. You can make charges normally, and you will receive a monthly statement. You’ll have to make a monthly payment, and your security deposit will only be used if your account is in default. After you build a history of on-time payments, you should be able to open a standard, unsecured account. Some card issuers might eventually offer you an unsecured account, along with a refund of your security deposit. Beyond concerns about your credit history, there are some other things you’ll need to apply for a credit card. You will need personal information, such as your name, address, date of birth and Social Security Number. In most cases, you’ll have to be a US citizen or permanent resident to apply for a credit card. Though some banks will accept an Individual Taxpayer Identification Number (ITIN) instead, which is the number used by resident and nonresident aliens alike to file taxes in the US. If you’re between 18-21, you’ll also be required to prove your ability to repay your credit loan. Basically, you need to prove your income, which can include sources such as wages from a job, student loans or government benefits. Non-working spouses can also use the income from their spouse, so long as they have a reasonable expectation of access to it to make payments. For example, if your husband or wife is working, and you’re not, then you could use his or her income to qualify for a credit card. Once you know you can qualify for a credit card, the next step is to find the right one for your needs. With thousands of banks and credit unions in the United States offering credit cards, finding the right one can be a challenge. If you already have a checking or savings account, applying for a card with your bank or credit union is a good place to start. This institution will already have your personal information on file. And because it already has a history of doing business with you, it may be more likely to approve you for a new account. The next option is to choose between a starter card or a secured card. Just make sure you examine the card’s terms and conditions before applying, so you can find the right fit for you. Remember that a secured card usually requires a deposit, while a starter card is usually a small credit line limited to a specific use (such as in a specific store). Never – I repeat – never sign up for a credit card before you check the card’s terms and conditions. Fortunately these days, credit card issuers are required to present the most important rates and fees in an easy to read table, rather than burying it in the small print. This table includes the card’s interest rate, called an Annual Percentage Rate (APR), as well as any fees. An APR is basically the interest you will be charged if you don’t pay off your balance. Some credit cards have an introductory APR that applies for the first few months, before switching to the standard APR. Heads up, you’re unlikely to find a starter card or a secured card with an introductory financing offer. However, there are some student cards that offer six months of 0% APR financing on new purchases. Pay attention to cards that offer a variable APR too, since that means your interest rates could change over time. You’ll also want to find a card with the fewest fees possible. Some cards have an annual fee, but many don’t. Some people choose to pay an annual fee to have a premium card with a more generous rewards program, but those cards aren’t typically offered to people with little or no credit history. Other fees to consider are late fees, balance transfer fees and foreign transaction fees. Ultimately, make sure you know exactly what you’re getting yourself into before you apply for anything. Capital One Journey® Student Rewards. This card is offered to full time college students. It offers you 1% cash back on all purchases, and 1.25% when you make your payments on time. It has no annual fee and no foreign transaction fees. Capital One Secured Mastercard. This card requires a minimum security deposit of just $49, but will give you a credit line of $200, and access to a higher line of credit after making your first five monthly payments on-time. There’s no annual fee and no foreign transaction fees. Discover Student Chrome. This card can earn you 2% cash back at gas stations and restaurants on up to $1,000 in combined purchases each quarter, and unlimited 1% cash back on all other purchases. It also offers you a $20 statement credit each school year that your GPA is 3.0 or higher, for up to five years. It has no annual fee and no foreign transaction fees, and Discover will automatically waive your first late payment fee. BankAmericard for Students from Bank of America. This is a simple credit card that offers no rewards, but has 15 months of 0% APR financing on new purchases, and no annual fee. BankAmericard® Secured. This card has a minimum security deposit of $300, but will return your deposit when you qualify for an unsecured account. There’s no annual fee for this card. Once you’ve chosen a credit card, your next step is to fill out an application. If you are applying for a card with the bank or credit union you already have an account with, it may be easiest to apply by calling them or visiting a branch. Alternatively, you can login to your account online and apply there. However, the vast majority of credit card applications are made at a bank or credit union’s website. When you apply, you’ll be asked to submit your name, address, phone number, email and Social Security Number. The application may also ask about your employment status. You can still be approved if you don’t have a job, but you will have to show some other form of income. You may also be asked if you have a checking or savings account, and what your monthly rent or mortgage payment is. Once you’ve submitted your credit card application, the card issuer will check your credit history. If you have zero credit history, this application for credit will create a file with at least one of the three major consumer credit bureaus, Equifax, Experian and TransUnion. Next, one of two things will happen. You may receive a notice of instant approval, or you may be told that you’ll be notified by mail. If you don’t receive instant approval, you still may be approved by mail. If your application is declined by mail, keep in mind that might not be the bank’s final answer. Try contacting the card issuer to discuss your application get them to reconsider. You could just have errors on your application, or need to add additional qualifying sources of income you may have left out. Even if you aren’t approved, don’t give up. The credit card industry is intensely competitive and many banks and credit unions are eager to build relationships with new customers. If you were declined for a starter card, try applying for a secured card. Secured cards typically approve applications from nearly all applicants who aren’t in bankruptcy, can prove their identity and can pay the required deposit. Once approved for a new credit card, you typically have to wait for it to arrive in the mail before you can use it. However, there are a few credit card issuers, such as American Express, that supply new account holders with their credit card number online, so you can use it instantly. You’ll have to activate it before you can use it. To activate your card, call the phone number provided or do it online. Next, set up online access to help manage your new account. 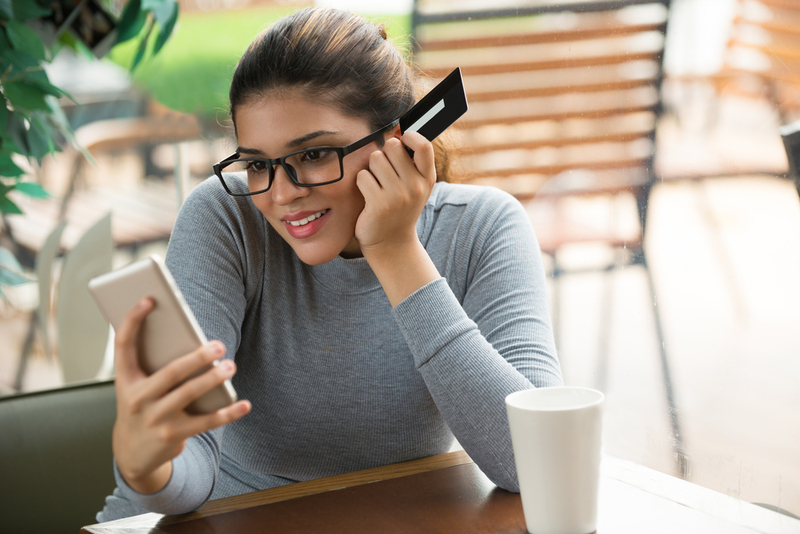 Online access will show you recent purchases and payment, give you access to statements, and let you utilize any features and benefits that come with the card, such as rewards points. You can also download your card issuer’s mobile app, which will offer much of the same functionality. Essentially, make it as easy as possible for yourself to stay on top of your balance and payments. Take advantage of the notifications offered by your credit card provider. Nearly all credit card issuers offer email or text notifications for important events. For example, you can configure your account to notify you of new statements available, payment due dates or even large purchases. Many credit cards now offer free, online access to your credit score. If they do, take advantage of it. Your score provides valuable information you can use as you build credit. It’s a good idea to regularly check your credit score so you can quickly find any problems and take steps to correct them. Once you’ve activated your card and set up your online account, it’s time to actually use your card to make purchases. Pro tip? Try to use your credit card like you would any method of payment. This means treat all your purchases like they’re being made with cash. Know how much you’re spending and where that money’s going. Since credit cards are easier to use than cash, some people use their card to spend more than they would have, or to make unnecessary purchases. These poor card habits could result in high interest costs, long term debt, and even damage your credit over time if you’re not able to make your payments. The best way to use your credit card is to pay every statement balance in full and on time. When you do this, you’ll never have to pay interest charges, and you rack up positive payment history, which accounts for 35% of your FICO credit score and helps you build credit. Finally, it’s important to think about the security of your credit card. Always keep it in a secure place, and avoid leaving it in your car, office or any place where others may have access to it. Never take pictures of your credit card and make sure it’s not visible in pictures other people take and share on social media. However, keep in mind that you don’t have to pay for any unauthorized charges that appear on your statement. This is a good reason to closely scrutinize your statements and look for fraudulent charges. If you suspect a charge is on your account that shouldn’t be there, contact your card issuer and report the problem. Bottom line Credit cards are a vital part of the American economy, but it can be a challenge to apply for your first card. By understanding what cards are available to new credit card users, how to apply for your first card and how best to use it, you can gain the most benefit from these important financial tools. Jason Steele is a leading expert on credit cards. His work has been featured on Business Insider, MSN Money and Yahoo! Finance, as well as on The Points Guy.